Bandar Seri Begawan - In conjunction with the 100th anniversary of the Public Works Department (under the Ministry of Development), commemorative stamps to mark the auspicious occasion are now on sale at all the branches of Postal Services nationwide. The commemorative stamps were officially launched by the Minister of Development, Pehin Orang Kaya Hamzah Pahlawan Dato Seri Setia Haji Abdullah bin Begawan Mudim Dato Paduka Hj Bakar, in the ceremony to commemorate 100th years of Public Works Department at ICC yesterday morning. Currently, there are only 9,000 copies of the first day cover on sale with 300 pieces of presentation pack of the commemorative stamps with 80,000 sets of stamps available. The stamps comprise of three different unique designs, namely the picture of the old Public Works Department building, the picture of the current Public Works Department and the 100th anniversary logo of the Public Works Department. I don't know how to explain this. I got the stamps more than a month ago and now only are they being launched?! How did I get the ebay seller to sell me the stamps a lot earlier. This is a case for someone on to look deeper into this. 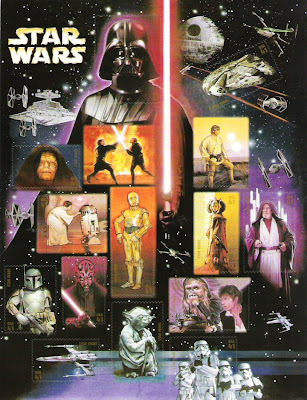 This American Star Wars Miniature Sheet quite intrigued me. I received a few letters with stamps of C3P0 and the other figures and I thought I will get the whole set. When this miniature sheet arrived, I realized that it is actually a sticker sheet and the stamps are stickers. There are 15 stamps on this sheet and they are not perforated in the strict sense of perforation. I am not quite a stamp purist but this kind of practise kinda make me think that this is not a proper stamp. But I guess, after about 150 years, stamps do change. My Singapore version of the ASEAN 40th Anniversary is here. Same stamps as before but with slight differences to incorporate that this came from Singapore. Not many people remember this $100 note. This is the first $100 note to be 'slimmed' down after the old $100 notes of the first Sultan Hassanal Bolkiah and Sultan Omar Ali Saifuddien. I had a hard time searching for this particular note. The $50 is easily found but not the $100. I was told that this particular note was a problem note as too many people liked it including those who are not supposed to be issuing it. A new $100 note had to be found soon after this note was introduced. So if you happen to find a genuine one keep it as it is becoming quite rare. If you found one which is not, report it as you would be guilty of the law even for keeping it even though you did not produce it. The following article was published in The Golden Legacy column of The Brunei Times, Brunei's national newspaper on 30th June 2007. 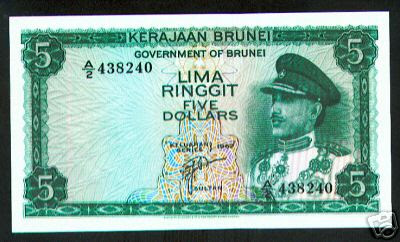 Brunei’s currency had undergone many changes in the past. 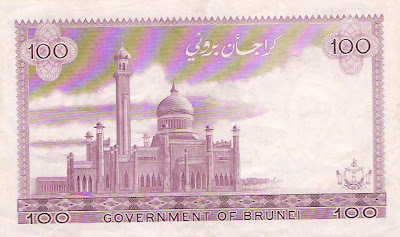 Historically Brunei’s ancient history, its long lineage of sultanate, its central strategic position in the trade between East Asia and Southeast Asia had meant that many goods and trades took place in Brunei as well as the circulation of many currencies such as those of China, India, the Arabic countries and the likes. At the same time, the various Brunei’s Sultans also produced a number of their own coin currencies commonly known as pitis. Numismatists divided Brunei’s many historic coins into three – one made up of issues by known Sultans, a second made up of issues by unknown Sultans and the third made up of issues of flowers and patterns. 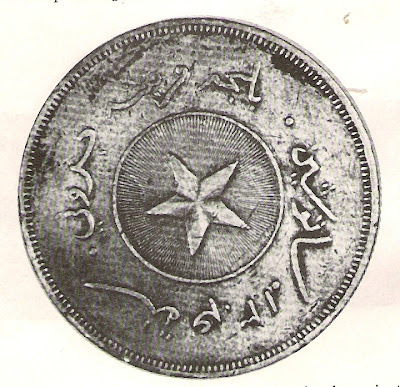 The last Sultan to issue his own coin was Sultan Hashim who issued the ‘star coin’ in 1886 which was minted in Birmingham, England. When Sultan Hashim agreed to have the British Resident in Brunei in 1906, he also acquiesced that the other currencies used by the British in the Straits Settlement (Malaya), Singapore, North Borneo (Sabah) and Sarawak to be used in Brunei Darussalam. 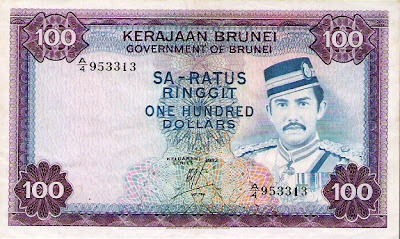 By the beginning of the 20th century, there were a number of these currencies being used in Brunei. The Straits Dollar issued by the Straits Settlement government then included that of Queen Victoria used from 1889 onwards (together with notes issued by Chartered Bank and Hong Kong and Shanghai Bank); King Edward VII; King George V and King George VI. Sarawak had issued its own currency too. Between 1858 to 1953, the various Rajahs of Sarawak - Rajah James Brooke, Rajah Charles Anthoni Johnson Brooke, and Rajah Charles Vyner Brooke each issued their own coins and notes. The British North Borneo (Sabah) too issued its own currencies between 1882 to 1953. In 1939, the Board of Commissioners of Currency Malaya was formed and it issued a new currency for circulation in Malaya (as well as in Brunei and Singapore) called the Malayan Dollar. 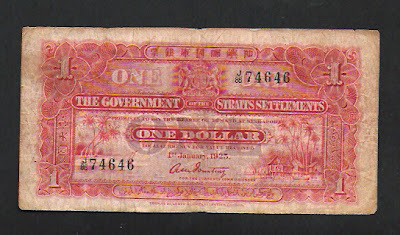 However the currency originally printed in 1940 was short lived with many of the notes captured by German forces at sea and then in 1942, the occupying Japanese Government had issued its own currency notes popularly known as ‘duit pisang’ even though only one of the currency notes ($10) portrayed the picture of the banana tree. The Malayan Dollar was revived after the end of the Second World War in 1945, the notes (dated 1941) and coins were reissued. One of the more popularly known coins then was the square ½ and 1 cent coin. The notes were printed in $1 (blue), $5 (green), $10 (red), $50 (blue), $100 (violet), $1,000 (violet) and $10,000 (green) – the forerunner to today’s currency notes’ colours. 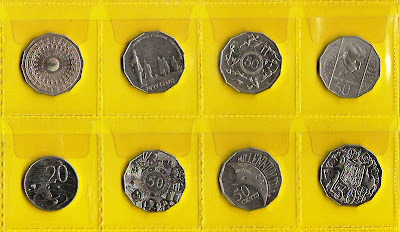 The coins replaced the paper notes that were issued prior to the war which were originally issued because of the possibility of shortage of metal during the war. The design on the currency notes had the portrait of King George VI and on the back, it had among others the crest of Brunei Darussalam as well as the crests of the various states making up Malaya and Singapore. In 1953, the Board of Commissioners of Currency, Malaya and North Borneo was constituted. The currency notes featured Queen Elizabeth II and were issued at the same denomination as the King George VI’s issuance. Brunei’s crest was maintained at the back of the note together with other crests. This new currency note replaced all the other currencies that had been issued by the Straits Settlement, the Sarawak State Government and the North Borneo Government. This new Board is now responsible for issuing new Malaya and British Borneo Dollar to be called officially as the Malayan Dollar meant for use by Malaya, Singapore, Sarawak, British North Borneo and Brunei. 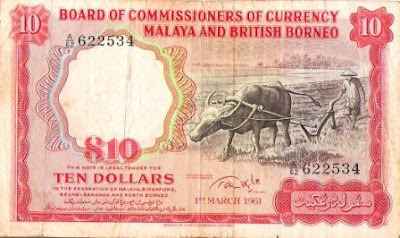 In 1959, the Board discontinued issuing the Malayan Dollar with Queen Elizabeth II on its cover for its $1 notes and later in 1961 the $10 notes. The new $1 notes had the sailing boat (duit kapal – ship’s money - as some Bruneians called it) and the new $10 notes had a portrait of a farmer plowing with an ox (popularly known as ‘duit kerabau’ – cows’ or ox’s money). The latter can be found for purchase at the Tamu for more than $200 a piece now. In between those years, the three countries, Brunei, Malaysia and Singapore also signed the Malaya and British Borneo Currency Agreement of 1960. In June 1967, the single Board of Commissioners was replaced by the three countries’ new bank and boards - the Brunei Currency Board, the Board of Commissioners of Currency, Singapore and Bank Negara Malaysia with each issuing its own currency. However the Malaya and British Borneo currency continued as legal tender for a few years at a reduced 85 cents per dollar as the British pound which it was based on was devalued in November 1967. The Brunei Currency Board issued the first Brunei Dollar on 12th June 1967 with the portrait of His Majesty Sultan Omar Ali Saifuddien III and maintained the same colour schemes as those of the last few issuances. Malaysia and Singapore also issued their own currencies on the same day. All three maintained the same sizes and the same colour schemes of the old Malayan Dollar. The three countries also agreed to maintain the exchangeability of their currencies but Malaysia left in 1973 leaving Brunei Darussalam and Singapore to maintain its currency interchangeability agreement until today. According to the catalog this stamp is worth between RM$400 to RM$600 which makes the US$19.95 I paid for it a bargain. This is a normal 1907 Brunei 3 cents stamp. I have a number of these stamps and probably can give it away without much problem. When this came on the market, I thought why would anyone want to sell this common stamp? Luckily I had my catalog book with me and I realised the value is worthwhile for me to splash out twenty bucks. So I did. What makes it unique is that this stamp is supposedly a specimen stamp. It was not supposed to be used and was handed out for postal authorities to inspect. Hence, that little overprint named "specimen". So far this is the only one I have ever seen. I don't want to see another one as the prices will start falling if too many of these specimens are found. My latest acquisition on the net at a cost of about US$113. This $1 Straits Settlement currency is a replacement for the coin on my last entry. Interestingly the first notes do not have portraits. 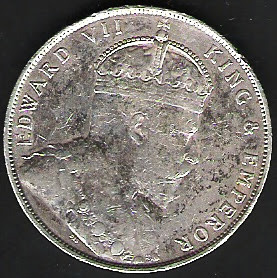 The first portrait is that of the 1935 $1 which will feature King George V. I am not sure how widely this was used in Brunei as the $1 coin British Trade coin and King George V coin remained quite popular even though it was demonetised. This is the first First Day Cover I received based on the ASEAN Architecture which is to commemorate the 40th of ASEAN Anniversary. All the ASEAN countries with the exception of Brunei and Myanmar (interesting company we keep) have issued their stamp sets, FDCs, maxicards etc. Ours is still languishing in bureaucratic approval process somewhere, or at least that's what the Philatelic people are telling me. The stamps are similar except that these ones have the Malaysian Post on it. I have a Singapore and a Thailand one coming. I have an ebay friend who has kindly kept me a Vietnam one. I tried getting my hands on a Philippines one the other day but at US$8.50 minimum bid, I thought was a little bit too steep. I will post the others as they come. The British Trade Dollar was issued from around 1895 to 1935. 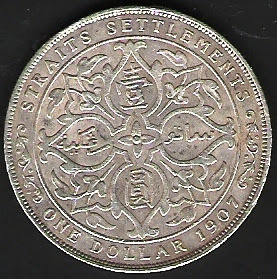 This coin was quite popular and used in Singapore and Hongkong to stop other countries' silver dollars from being circulated in British colonies. This coin was known as Ringgit Tongkat in Malaya. The above coin was used from 1903 onwards when the British Trade Dollar was demonitized (but it remained widely used in Borneo). The only difference between the coin above and that of the trade dollar was the front. The British Trade Dollar had a lady holding a staff. The reverse is the same. This particular example was of a reduced size. In 1903 and 1904, the coins produced were the same as that of the British Trade Dollar. In 1907 and 1908, it was reduced as the price of silver fluctuates. The coin was made of .925 silver. When you look at that $50 polymer note in your wallet or your purse, you can't quite remember what the $50 looked like before that. That is assuming you can find a $50 polymer note. They are becoming rarer too. I asked the Currency Board people and they said that banks normally wanted $1, $10 and $100 and rarely $50. It's because $50 notes are not normally dispensed by our banks' ATMs. Anyway I digressed. The last $50 paper note is quite an attractive one. It is being sold on ebay on two buy it now sites for about US$69.99 and US$89.99 which is not bad considering it is only a few years ago that the note stopped being issued. In fact, this is the one note which I found quite attractive compared to a number of Brunei's paper notes. It also shows Brunei's main exports - that of an oil tanker on the front and on the reverse that of an oil rig. This is the only note that showed anything other than nature or buildings in Brunei. My sister who worked in a bank managed to get hold of 10 pieces of these notes - condition AUNC (Almost Uncirculated) with interesting numbers. A depositor came in carrying 10 pieces of this in running numbers! So I have a running number of 10 here and I don't know how much that is worth on ebay. I finally managed to get my hands on the last stamp missing from my 1907 stamps. That last 5 cent stamp cost me about US$30 but it was worth every single cent I paid for it. The 1907 series is the first ever official series that the Brunei Postal Authorities produced. Even though, there was an 1895 series - that was not produced by the postal authorities but by a Mr Robertson who did it because he thought he will make money from it. The second 1906 series was only a stop gap measure by the Brunei Postal Authorities because that was the Labuan stamps being overprinted with the word Brunei. So this 1907 is the first official one issued by the Brunei Postal Authorities. You know, I have to put this in the safe now. 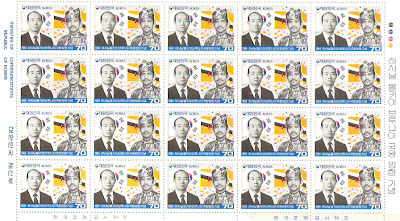 The above is an interesting set of stamps supposed to be issued by all ASEAN countries at the same time to commemorate the 40th Anniversary of ASEAN. 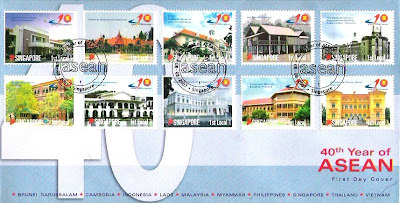 The stamps showed the various architecture in various ASEAN countries. Brunei's is the Secretariat Building which I am not sure is really reflective of Brunei's architecture but that's not for me to comment. However, so far I have only seen the Vietnamese stamps, I have not seen any of the other countries' stamps. I know in Brunei, the postal authorities have not got the green light to release it yet. I don't know what happened to the other ASEAN countries. Singapore, 27 June 2007...Singapore and Brunei Darussalam today celebrate the 40th Anniversary of the Currency Interchangeability Agreement between the two countries. To mark this significant event, Prime Minister Lee Hsien Loong and His Majesty Sultan Hassanal Bolkiah Mu’izzaddin Waddaulah, The Sultan and Yang Di-Pertuan of Brunei Darussalam, jointly launched the $20 polymer commemorative notes issued by the two countries, in a ceremony held in Bandar Seri Begawan, Brunei. (Please refer to separate joint media release by MAS and Brunei Ministry of Finance on the ceremony and background on the Agreement). 2. Three million Singapore $20 polymer notes will be introduced into circulation gradually over a period through the banks. This one-time only issue also comes with a limited edition bearing a special over-print. 3. The limited edition note set in a special folder will consist of two notes - one Singapore $20 (with a special over-print of the two countries’ state crests and text “40th Anniversary Currency Interchangeability Agreement”), and one Brunei $20 (with special over-print of the text “40th Anniversary Currency Interchangeability Agreement”). The two notes, with matching serial numbers, add up to a total face value of “$40”, marking the 40th Anniversary of the Agreement. 10,000 sets will be available at $88 (GST inclusive) per set. 4. The public can start placing orders from 28 June 2007 on a ‘first-come-first served’ basis for as long as stock lasts. Orders will close on 6 July 2007 and the note sets can be collected from 16 July 2007 onwards. 5. The circulation notes will be available at banks commencing 16 July 2007. 6. The note is predominantly orange in colour. It measures 149mm by 72mm, which is between the size of the $10 and $50 notes. Portrait of Singapore’s first President, the late Encik Yusof bin Ishak, and the text “Yusof bin Ishak, First President of Singapore” below it. As with the $10, $5 and $2 polymer notes, MAS has continued with the portrait series for the $20 polymer notes as the public is familiar with the series. A stalk of the “Dendrobium Puan Noor Aishah” orchid (named after the wife of the late President Yusof Ishak) besides the portrait. A row of motifs of the Oncidium Goldiana orchid, a renowned Singapore heritage orchid species. Two interlocking “C”s (representing the two countries’ currencies) with the text “BRUNEI DARUSSALAM ∙ SINGAPORE and CURRENCY INTERCHANGEABILITY AGREEMENT 1967 - 2007”. At the intersection, the state crests of both countries and the text “Forty Years” symbolize the nexus of the agreement. 8.2 Distinctive national landmarks of Singapore’s Esplanade - Theatres on the Bay and buildings along our city waterfront, and Brunei’s Omar ‘Ali Saifuddien Mosque with the Royal Barge and the water village. Two see-through windows – one on the top-left hand side and the other at the bottom-right corner. A stylised gold Singapore Lion Symbol with a hidden image, beside the top-left hand window. An image of the Singapore Arms will appear at varying angles. The security thread in the shape of the Singapore island. A colour switching feature on the lower left and right edge of the note that changes from red to gold colour at varying angles. I am desperately looking for the above note. If there is anybody out there, I will buy the note off you and at least 10 times its value. Let me know, email me at bruneiresources(@)gmail(. )com [remove the brackets if you want to email me.] Thanks so much. I was in Ozzie land two weeks ago. I spent a week there, other than listening to the policy makers talk about money and the economy, I did manage to get a round of golf in at the Coolum Hyatt Regency, home of the Australia PGA Championship. I thought the course would be tougher but after Jerudong JPCC and Empire's Golf Courses - the one in Oz is tame. Anyway, I am not here to talk about golf or work. What I realised after a couple of days there, the Australian Government loved to use their coins. Out of the bundle of coins that I amassed were 50 cents coins. At first I thought there was only a couple but apparently most of the 50 cents I collected were special editions. Each coin commemorated something. I only managed to get 7 50cents, that was with the help of our assigned driver and they commemorated the Silver Jubilee, WW2 Remembrance, the Commonwealth Games in Melbourne, someone called Weary Dunlop who did something heroic in WW2, the Milennium, Australia's volunteers and a normal 50 cents. The same thing is also on the 20 cent coins. If you happen to be in Oz land, take a look at the coins in your pocket or your purse and see history happen in front of you. I found this to be quite an intriguing note. This, in case you don't know it, is the last $5 to be issued on paper before today's $5 polymer note. The intriguing bit about it is that when you look at it, you know it was not that far back when you had it in your wallet. But when you think hard enough, it was quite a while ago when it was last in your wallet. In fact, it must have been 10 years ago! Anyway, to get one is not that hard - you can still find it in shops - there are still people using it - them not realising the value of their $5 note. This $5 note is currently being traded at about 3 times its face value, so a piece would get you around $15. But the note I have up there is worth more than the 3 times. Look at the triple 8 numbers at the end. See? Okay, if there is anybody out there who has more money than sense, pleace call or email me. I am willing to give up this note for the really really right price. If you know what I mean? I won this item in an ebay auction. I didn't know it existed before that auction. I can't read Korean I am not sure what it commemorated but I am guessing that it was the start of the diplomatic relationship between Brunei and South Korea way back in 1984. If you look at His Majesty's Orders and Medals that had been awarded to him, there is a Mugunghwa Order or something like that which was bestowed by the Korean President. In the meantime I am not sure what to do with this sheet of stamps. I don't want to break it up but it is a bit difficult to keep with this size. If you are born after 1980, ask your parents about the above money. If you are born before that, you might have just seen it. This $100 is of the second series of Brunei currency. The first series has the portrait of His Majesty Sultan Haji Omar Ali which was released in 1967. This second series was released in 1976 and another printing in 1982. Both the first and the second series has the same colour and design. The only exception is the portrait of His Majesty Sulan Haji Hassanal Bolkiah replacing that of His Majesty Sultan Haji Omar Ali. If you happen to find this in your dad's safe, DO NOT SPEND IT. Technically speaking this note is only worth $100 if you bring it to the shop. The shops will accept it after looking at the quizzically. If you bring it to a money dealer (or to me), he will give you US$300 ($450), I would bargain with you for it to be around US$200. 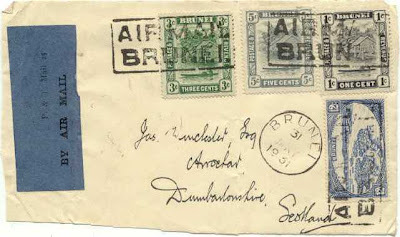 "This bedraggled airmail cover was postmarked with a simple single ring CDS for Brunei. Brunei is a small enclave on the northwest coast of Borneo surrounded by Malaysia. At first blush, it was thought that this cover most likely would been carried by Netherlands airmail service (KLM). Service between Amsterdam and the Netherlands East Indies had been established in 1927. However, that is not the case. In 1931, the RAF conducted survey flights around Sarawak, Brunei, Labuan and North Borneo. Three Southampton flying boats, S. 1162, S. 1161 and S. 1128 were used to conduct the surveys. In the second phase of the survey, mail was collected on their return trip from the survey area. The flying boats left their base at Kudat, North Borneo, on June 1, 1931, for Kuala Belait, Brunei, and then on to Miri, Sarawak, arriving the same day. The flying boats reached Singapore on June 5, 1931. This cover would have been placed on board S. 1162 at Kuala Belait. 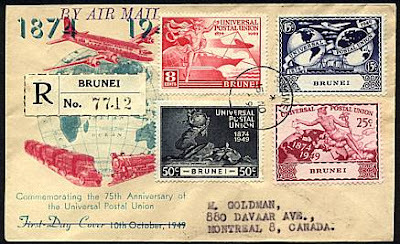 The boxed AIR MAIL BRUNEI (3 used on this cover) plus the May 31, 1931, CDS were used for this flight. The boxed cancel had also been used for mail carried on an earlier survey flight in April, 1931. It is not known how much mail was collected at Kuala Belait but not many covers have been recorded. On the final leg of the flight from Kuching to Singapore, only about 185 covers were carried. The cover would almost certainly have been carried by sea from Singapore. The prevailing air mail service (Karachi-London) was charged 20c plus 6c surface mail and the KLM flight 56c. Unless there had been some superscription to the effect that it was to be carried by air mail for any leg beyond Singapore, plus the requisite additional postage, one can safely assume it was carried by ship. The air mail cancel was used specifically for the RAF flight and not for general air mail. The destination was Arrochar, in Dumbartonshire County, Scotland. Dumbartonshire is a small (270 sq mi) county on the north side of the Clyde estuary northwest of Glasgow. Arrochar is at the head of Loch Long, a 17-nile long sea loch which has good fishing (when the dredgers keeping the Clyde open don't ruin it with their spoils). Arrochar is about 30 miles northwest of Glasgow. The cover is franked with four stamps; 1c. black, 3c. green, and 5c. gray 'Brunei River views' of the 1924 series, and a 12c. blue 'native houses in a water village' of the same series (SG 60, 63, 67, and 74). The airmail etiquette appears to be a government form which is cut from a larger sheet at time of use. It appears to have a form number "P. & T. Mail 25. I have it on good authority (Jim W-S) that Arrochar is delightful spot; that is also near the foot of Ben Lomond; and also fairly close to the former US nuclear submarine base at Holy Loch; (it's also a short distance from the noted Loch Lomond). When you're in Arrochar, you're in the heart of the action! Which is probably why Jas. Winchester, Esq., had mail from the obscure sultanate of Brunei!" Extremely Rare 1949 Brunei First Day Cover? In 1949, Brunei released the first ever stamps which are totally different from those it has released before. Prior to this, Brunei has only worked on three designs - the 1895 'star' stamps (not an official release according to some), the 1906 Brunei overprints on Labuan stamps and the 1907 Kampong Ayer stamps which came out in multicolour from 1907 to 1947 plus a small change in design. 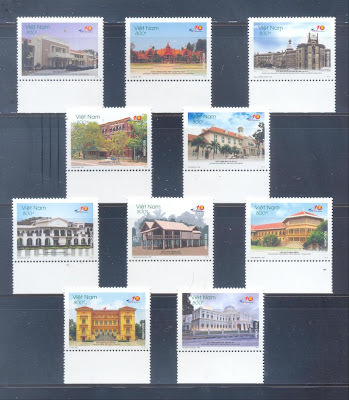 It's amazig that for around 50 years, the Brunei postal authorities worked on these few designs only. So in 1949, Brunei released a set of stamps to commemorate the 75th anniversary of UPU which has sophisticated and interesting designs. Has the authorities suddenly turned into design freaks? Unfortunately or fortunately no. The Brunei UPUS stamps are part of an "Omnibus Issue" by 78 of the member nations of the British Commonwealth, most (65) of whom chose to issue the same set of four designs, differing only in colors, the name of the issuing country and the values. If you have bean around the stamp world, you will notice these. When writing this, I am in Australia and do not have access to my catalogue and I was not sure that Brunei had a first day cover for this. I was quite surprised to find the above photo for a Brunei FDC. But this FDC has the the text designating this as a First Day Cover has been lined out, since the cover was postmarked on November 15, not October 10. Yet it contains the entire set of stamps, and is on the specially cacheted cover, and was part of a set of 1949 UPU FDCs. Perhaps there is a story here - are true FDC's of this issue from Brunei scarce or non-existent? I will do a PS when I get back from Australia. During the Japanese occupation of Brunei, the Japanese used the unused Brunei stamps captured during the occupation and overprinted those with the word Japanese Government. 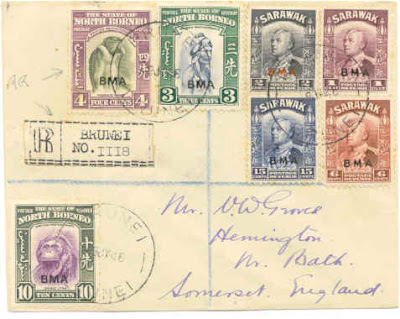 But once the Allied Forces took over Brunei, they could not use Brunei stamps and they decided to use North Borneo (Sabah) and Sarawak stamps and overprinted those stamps with BMA (British Military Administration). 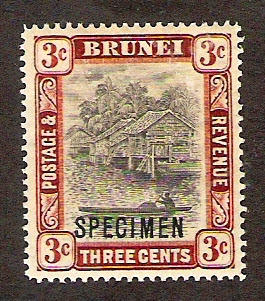 The stamps used for Brunei are very difficult to find as you have to find either the Sarawak or North Borneo stamps with the postmark "Brunei" clearly visible on the stamps. This particular specimen (above) is one example of the BMA usage and the letter was clearly registered in Brunei in 1946. The usage of Sarawak and North Borneo stamps overprinted BMA lasted for slightly more than a year (53 weeks). This particular rare letter has a value of around US$475.00 if anyone wants to buy. You can get it from a rare stamp dealer at www.mayoph.com in Indianapolis, Indiana.